Pearl Henson Galloway, age 92, passed away peacefully on January 24, 2017. She was born Feb 11, 1924 to David "Doc" and Rilla Henson of Pearcy, AR. After the death of her father at a young age, she went to live with an aunt and uncle in Seminole, OK so she could attend high school. It is noteworthy that coming from rural and meager surroundings, she excelled and graduated as Valedictorian of her high school class in 1942. Pursuing her love of education, she worked her way through Henderson State Teachers College where she was named to Who's Who Among Students In American Universities and Colleges, 1950-1954 edition. She graduated with honors (class of 1951). Returning to her roots, she began her teaching career at the new Lake Hamilton High School as one of the original English teachers. Following that she taught high school English for several years in Pine Bluff before returning to teach at Henderson State. Still not done, Pearl was accepted into the Master's program on a graduate assistant fellowship at the University of Arkansas at Fayetteville. After earning her Master of Arts degree in 1959, she received a personal letter of congratulations from then Senator J.W. Fulbright. Professor Henson returned to Henderson State to teach in the speech, drama and communications department. Niece Sheryl (Owens) Bright took many of her classes and has often declared what an intensive course regimen she required of all her students. Although very demanding of perfection, she also gave her students invaluable praise and confidence to speak in many different situations. She formed the Readers' Theatre program and directed many of the college's theatrical performances. In 1969, Professor Henson was offered a teaching position in the communications department at the University of Arkansas in Fayetteville. This was TRULY her dream job. She started a traveling Readers' Theatre Troop that toured public schools throughout Arkansas and Oklahoma providing programs to elementary school children. Even though her love of teaching was her greatest achievement, her love of sports -- specifically the Arkansas Razorbacks -- never took a back seat to anything. She attended every football and basketball game possible. Frank Broyles approached her about helping his players handle the stress of live television interviews. She gladly accepted this offer to help her beloved Razorbacks. She was a great supporter for women's athletics as well. She was accepted into the doctoral program at the University of Colorado in Boulder. It was an honor to just be considered and an even greater accomplishment to be accepted into such a prestigious program. 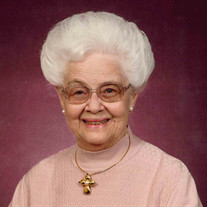 She retired after 20 years of service as an educator with the University of Arkansas in 1989. Just a few of the many honors during this time included: President of the Arkansas Speech Communication Association, Personalities of the South, Arkansas Speech Award, Honorary Member of the National Collegiate Players Fraternity, Century Club Award, Razorback Club 'Big Red Status' for support of the educational athletic scholarship program, inductee to Delta Kappa Gamma Society International, Lambda Pi Eta Outstanding Professor and Advisor, Letter of Appreciation from the 1983-1984 Razorback Basketball Team and Coach Eddie Sutton. At her retirement ceremony, it was noted that she consistently assumed extraordinary teaching responsibilities and fulfilled them with energy and enthusiasm. She was instrumental in the creation of the M. Blair Hart Scholarship Fund for communication majors. She had more than proven herself as an exceptional instructor, benefactor and friend to thousands of students. The awards continued after retirement to include: Confirmation of Emeritus Status at The University of Arkansas (1989); promotion of Literacy from the Arkansas State Reading Council, and Recognition for Outstanding Service to Speech and Theatre Education from the Arkansas State Communication Association, Diamond Circle Certificate signifying 60 years in Beta Sigma Phi where she held all offices many times over as well as State Sweetheart and Girl of the Year. Following her retirement, she was not one to slow down and be idle. She was an active volunteer with the Baptist Health Medical Center, serving not only patients and families but also as the auxiliary president for many years. She loved to work with Chaplain Services as well as Outpatient Surgery Services. She was on the cover of the Healing Force Christmas publication as 'Grandma Brown', and continued the role with reading to the children in the Pediatric Unit. Years of volunteering culminated in thousands of volunteer hours not only in Fayetteville but also in Little Rock and North Little Rock, Arkansas. She was a member of Central Baptist Church in NLR, AR. She taught Sunday school, was a member of the Sr. Adult Choir, and participated in many of the drama productions. She was also an active participant with the Family Support Group of the 374th' Helicopter Ambulance Army Reserve Unit. When the unit deployed to Saudi Arabia in support of Desert Storm, she attended all family support meetings and counseled with families during this most difficult time. She was known by the soldiers and their families as 'Aunt Pearl'. Her next venture was to help her niece, Sheryl, and her family when they opened Bright Balloons & Baskets. She spent countless hours minding the shop, answering the phone, taking and filling orders, and providing customer service to walk-in clientele. She worked tirelessly to help make the business a success. She loved to travel and did so quite frequently. One of the more noteworthy trips was a pilgrimage to Jerusalem with Mike and Janet Huckabee in 1994. She was very fond of the Huckabees, and she would tell you that this was definitely the trip of a lifetime. Up until her death, she was still getting letters of thanks and appreciation for her many years of support to her thousands of students. It is profound that after retiring, her work is still impacting people today. To say that we have lost a brilliant teacher and an even greater person is an understatement. Her surviving family includes: sister Mary Johnson, Texas; brother James Henson, California; principal caregivers Sheryl Owens Bright (Darrell) Alabama and great niece Victoria Bright Butler (Scott) Arkansas. She was a doting aunt to Jerry Owens (Lorrie), Texas; Celia Ann Yancy (John), Texas; Jennifer Simpson (Jeff), Oklahoma; Rachel Weems (Kevin), Texas; Russell Johnson (Lisa), Texas; Kimberly Henson, California; Debbie Varner (Dan), Arizona; Elizabeth Bright Koby, Alabama; and numerous great-great nieces and nephews. Visitation will be held on Sunday, January 29th from 3:00-5:00 p.m. at Sherwood Smith Funeral Home. In support of Pearl's beloved Razorbacks, please come and show some love wearing your favorite "HOG" memorabilia. Celebration of life services will be Monday, January 30th at 10:30 a.m. at Sherwood Smith Funeral Home. Interment will be at Memorial Gardens, Hot Springs at 2:00 p.m. In lieu of flowers, donations can be made to the University of Arkansas in Fayetteville, Razorback Foundation 1295 S. Razorback Road #A Fayetteville, AR. 72701 gohogs@razorbackfoundation.com or memorial contributions may be made to the M. Blair Hart Scholarship Fund at the University of Arkansas, 300 UNHS, 1 University of Arkansas, Fayetteville, AR 72701.